The second day of the Mr Oil Wexford Juvenile T&F Championships drew massive crowds to the Enniscorthy Sports Hub last Sunday. As the early heavy rain and mist gave way to glorious afternoon sunshine the audience was treated to a feast of exciting and hard-fought athletics action. 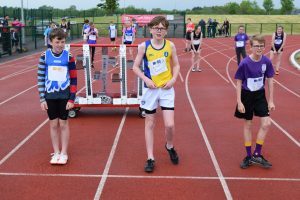 An enjoyable feature of the County Championships is that athletes move beyond the comfort zone offered by their main event and try their hand at other events. The number of multiple medal winners mentioned in this report gives some indication as to just how popular this approach is and, equally, how strong many of our athletes are across a range of events requiring quite different strengths and skills. They don’t come more multi-faceted than Ruby Reynolds. This young lady is a force of nature. 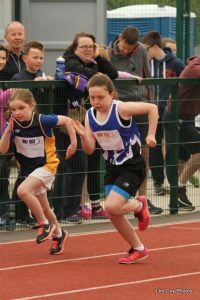 Despite the fact that she is still in her first year of competitive athletics she already has an All-Ireland Indoor Gold medal in sprint hurdles. 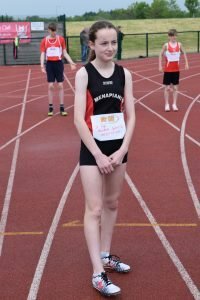 Last Sunday the Menapians athlete, competing U13, showed just what a phenomenal and untried talent she is as she powered her way to victory in three events: 60m, 60m Hurdles and High Jump. In the two sprints there was plenty of daylight between her and her closest pursuer. In the High Jump, while she called a halt having cleared 1.25m she looked to be clearing a height well in excess of that. Definitely a candidate for Athlete of the Meet. Having said that there were others who would be challenging for that title. Jack Forde (St Killian’s AC), having become All-Ireland Combined Events Champion the previous day, won the U16 High Jump (1.60m), the Triple Jump (12.05m) and the Shot Putt (10.98m), the latter ahead of another multiple medal winner Nathan Murphy (Menapians). Jack also took Silver in 200m, Bree’s Darra Casey taking the win in the latter in a last desperate dip for the line. Including his Long Jump Gold from the previous day’s action Jack is easily the most prolific of our medal winners. No less versatile is Aisling Kelly of Taghmon AC. She started her campaign with wins in U16 250m Hurdles and 100m before going on to win Shot Putt (8.06m), Triple Jump (9.29m) and 200m. 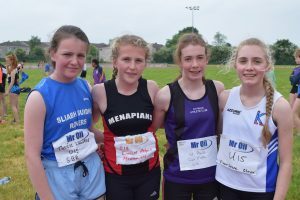 She was also a member of the winning Taghmon Relay team. With her dedication, focus and raw ability she is, without question, one to watch. 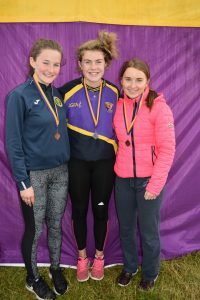 Saidhbhe Byrne, Enniscorthy AC, another athlete who made the podium at the All-Ireland Combined Events, won U15 80m Hurdles, Shot Putt and, towards the end of the day and following a terrific tussle with Rachel Gregg, High Jump. Saidhbhe’s temperament and general approach to the sport is exemplary. Cosmo Hewlett (USAC) looked hugely impressive in U14 Javelin, winning with a best effort of 36.14m, almost 12 metres clear of the field. 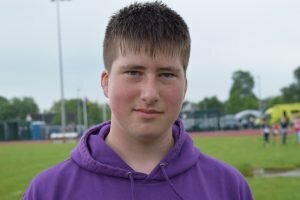 He also won 80m and 200m, and was 2nd, behind his brother Myles, in 800m, the latter result being exactly the same as in the 1500m two weeks previously when Cosmo also took the Shot Putt title. The marzipan on the cake was helping his relay team nab the runner-up spot behind Bree. With his winning mix of strength, speed and endurance Cosmo really is the ultimate all-rounder. Should he choose to go the Combined Events route he surely has a bright future ahead. 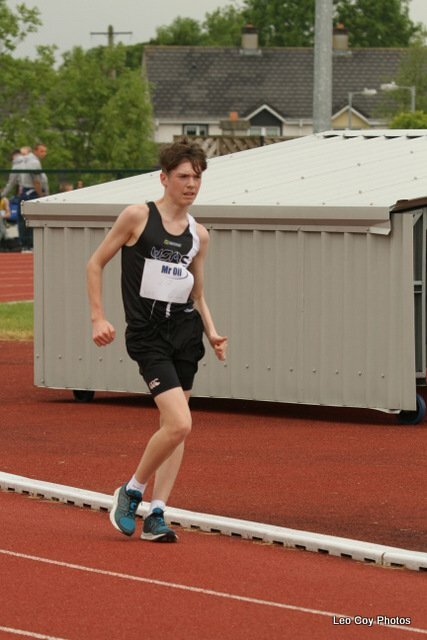 Another classy looking all-rounder is Ben Wall of Adamstown AC: he won U15 High Jump, 200m and 800m to go with his previous win in 1500m. 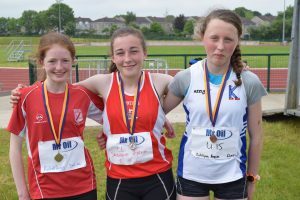 There were more Golds for Adamstown with Tara Doyle winning U18 200m and Long Jump and Stephen Power taking U12 Shot Putt Gold. SBR’s multi-talented Orlaith Deegan, having earlier in the month become U14 County High Jump Champion as well as winning a Bronze medal in Shot Putt, won U14 Long Jump with a best of 4.02m. She also won 75m Hurdles and was a close 2nd in both the 200m, behind Menapians’ Ailbhe White, and the 800m behind another Menapian, Sinéad O’Reilly. 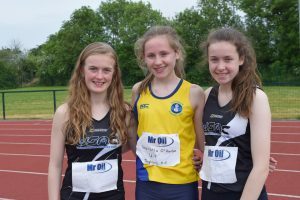 Sinéad’s win gave her the middle distance double as she won the 1500m two weeks previously. 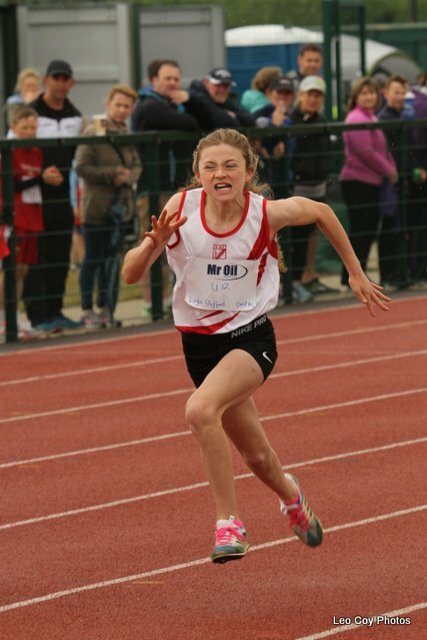 Ailbhe White (Menapians) has a killer stride and an abundance of fast twitch muscles to push it along as she showed in winning 80m and 200m (U14). Kevin O’Mahony (DMP) would appear to be blessed with fast and slow twitch fibres in equal measure since he can deliver equally well in longer distances, as he shown in the past, as in sprints and jumps. 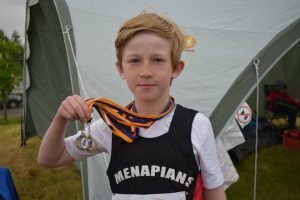 He showed great explosive power in adding a pair of U12 Golds, in Long Jump and 60m, to the Golds from the previous day in 100m and High Jump. Indeed DMP’s strength at underage track running continues to grow with a 1-2 in U9 60m for Judy Sinnott and Saoirse Flanagan followed by a Gold in 300m for Saoirse; and Cora Kelly’s win in U13 600m. Menapians’ U11 speed merchant Cian Donovan had a very successful campaign with wins in 60m and 600m to go with his win the previous day in 100m. Oisín Rochford of Bree AC, having already taken a Silver in U13 Shot, won the 60m Hurdles and placed 2nd in 80m. There was further sprint glory for the club with Darra Casey taking both the 100m Hurdles and, as mentioned above, 200m titles (U16) and Olivia Howe winning U19 200m. 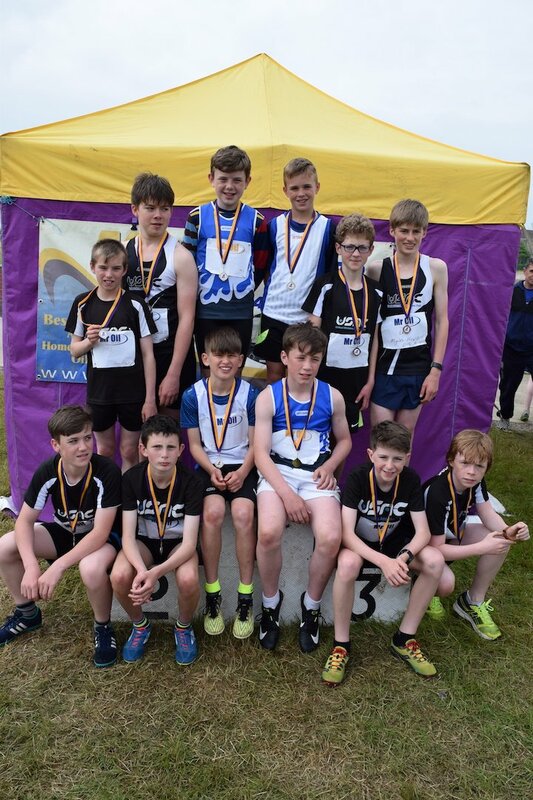 There were sprint hurdling Golds also for: Striders duo Eoin Hannon (U12) and Eoin Shannon (U14); Adamstown’s Robert Wall (U15); St Killian’s Sonya Milburn (U16); and Paul Gately of DMP (U18). David Obasohan, Enniscorthy AC, the U18 County 100m Champion, won Long Jump and 200m and was 2nd, behind Kilmore’s Jack Roche Doyle, in Shot Putt. Indeed, the latter was well ahead of David with a best effort, and a new pb, of 10.65m. Sammy Delaney (St Paul’s AC) looked majestic in winning U19 Long Jump and 200m. Enniscorthy’s Jacob English was 2nd in both cases while also taking Gold in Shot Putt. Conor Brennan (DMP) started his campaign a fortnight ago with a Gold in U17 High Jump, Silver in 300m Hurdles and Bronze in 100m. Last weekend he won the sprint hurdles race, placed 2nd in both Shot and 200m, and was 3rd in Long Jump. He should be feeling confident as he faces into the Leinsters. 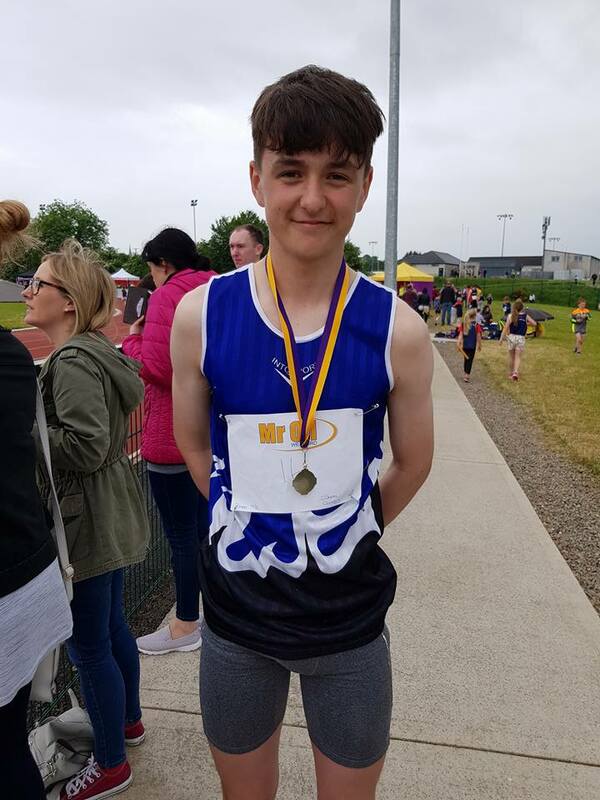 Malachy Cathcart (Enniscorthy) won U14 Long Jump and placed 2nd in 80m. 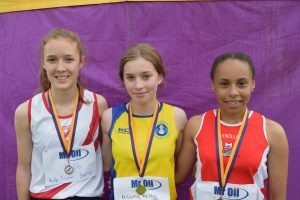 Blánaid Fogarty (Enniscorthy), having won U17 300m Hurdles and 100m the first day, added another Gold in 200m before going on to take a Silver in Shot and placing 3rd in both 800m and 100m Hurdles. The latter was one of the best and most competitive hurdles races of the day with Bree’s Sophie Codd taking the win and Liadh Dwyer of Menapians in 2nd. 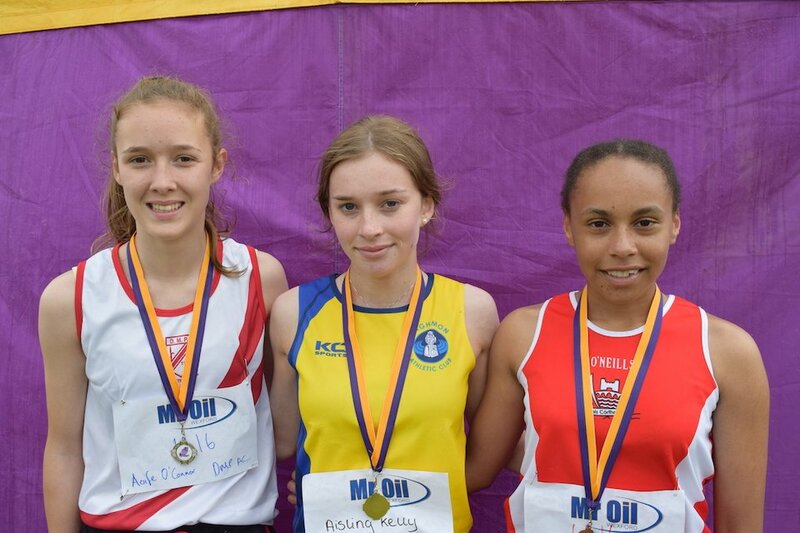 Rachel Power (Adamstown) won U17 Shot Putt and placed 2nd in both 200m, behind Blánaid, and 800m. 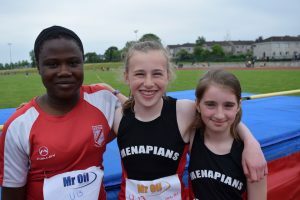 Blánaid’s victory in the 200m was a balancing of the books as Rachel had come out on top in their High Jump duel the previous day. Versatility aside, Rachel’s positive can-do attitude and cheerful disposition are two assets every young athlete might strive towards. 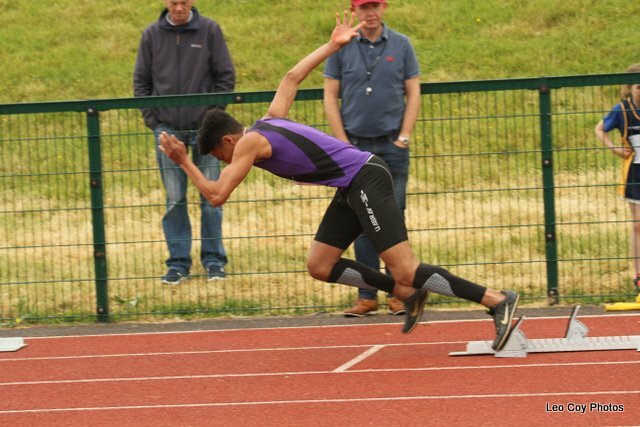 In winning both U17 300m Hurdles and 1500m at Day 1 of the County’s Aaron Browne (USAC) showed that he has speed endurance as well as speed. Just in case one was in any doubt he drove home the point last weekend by following up with wins in 200m and 800m. Rob Sterling, competing U13, was one of St Paul’s AC’s most successful performers over the two days of the Championships with wins in Long Jump, 600m and High Jump, and Bronze in 80m. The ever improving Eimear Fortune, Kilmore AC, held off a tough counter-attack by Ciara Martin of St Paul’s AC to take the Gold in a thrilling U15 800m. Eimear also placed 4th in the 200m. U14 athlete Myles Hewlett (USAC) is a natural born running machine. As in the 1500m on Day 1 of the Championships, he took off like a rocket in his 800m and kept his foot on the gas all the way to the finish line. As mentioned above his brother Cosmo won the race for the Silver. Myles also picked up a Bronze in the Relay. 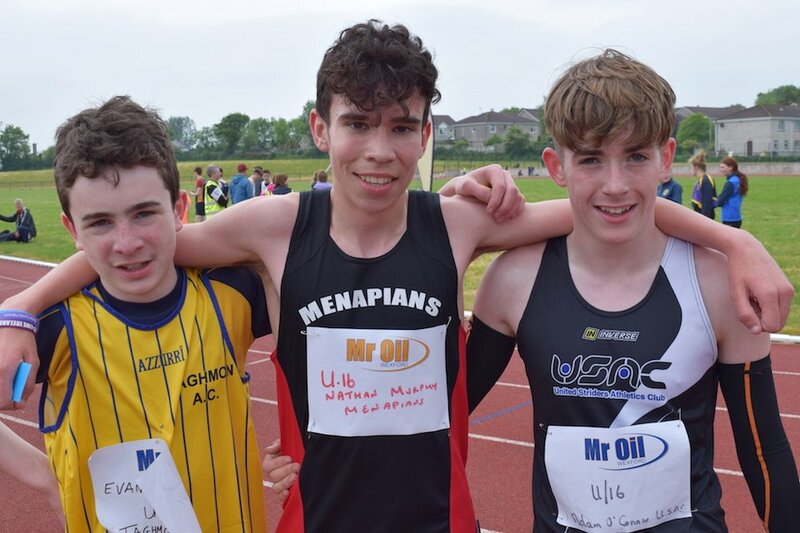 Nathan Murphy of Menapians is developing into a fine middle distance runner as evidenced by his winning run in U16 800m (2.08 mins pb). There was also a Silver medal for Nathan as he placed a good 2nd, behind Jack Forde, in Shot Putt (10.37m). 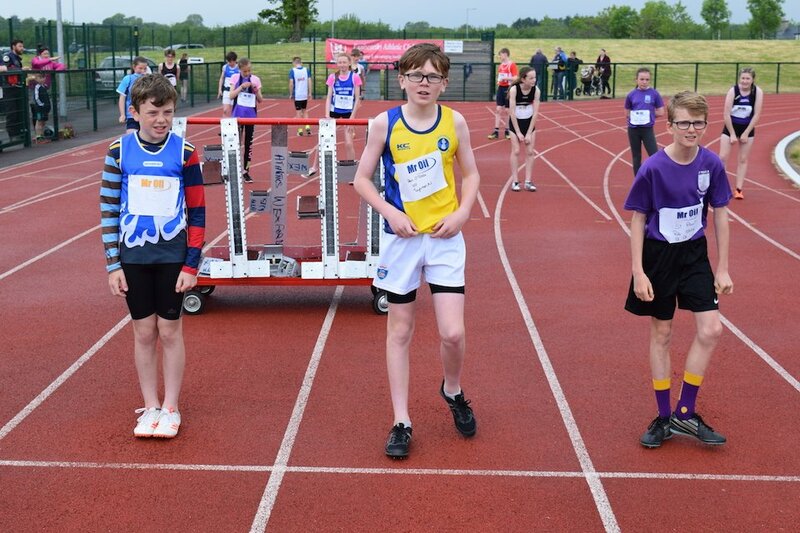 Nathan’s club-mate Jack Halpin was a very convincing winner in U13 Javelin (17.02m). Aedan Rogers (USAC) is already a fine distance runner, as he showed the previous day in the 1500m. This time out he gave a classy display from gun-to-tape in winning U19 800m. There was also middle distance success for the USAC ladies with wins for Louise Doyle (U16), Aisling Power (U17) and Rebecca Bawden (U18). 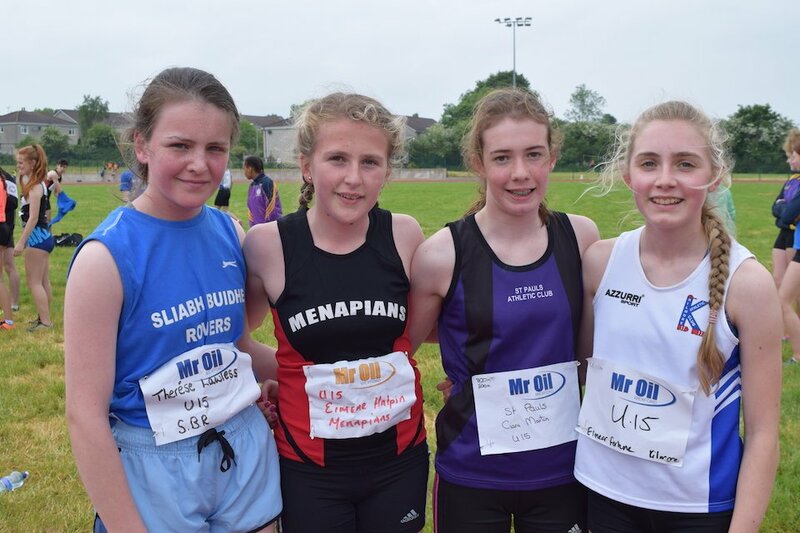 Emma McCarthy (St Killian’s) won U11 600m and Cara Kelly (DMP) won U13 300m. 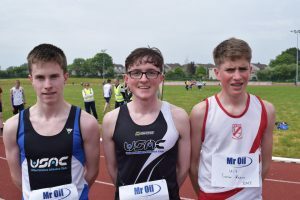 Paul Freeman (St Killian’s) won U18 800m. Ciara Mooney (Adamstown AC) held off the challenge of Grace O’Keefe (Macamore’s) to win the U14 Javelin in 21.39m. Bree’s Grace Donohoe won the U13 Javelin by a street with her final throw (22.16m). Gergely Pap (St Pauls), competing U17, showed wonderful technique as he launched the shot out to 12.00m, well clear of the field. He will be a force to be reckoned with when he eventually moves into the Senior ranks. Shannon Codd (DMP) was a runaway winner in U12 Shot Putt with a best of 7.26m. Club-mate Grant Palmer won the U15 Shot (11.41m). There was nothing between Shannon’s club-mate Layla Stafford and Katelyn Doran Farrell (Enniscorthy) in U12 Long Jump with both getting out to 3.89m. Layla was adjudged the winner on countback giving her a Gold medal to add to her Silver in High Jump. 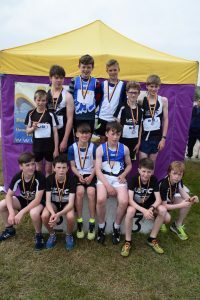 There were also Long Jump Golds for Enniscorthy’s Tomas Brennan (U10), Striders athlete Patrick Doyle (U17), Taghmon’s Hannah Roche Kelly (U17) and Tara Doyle of Adamstown AC (U18). Bree’s Shane Laffan Bree AC, having won the U9 60m, went on to win the 300m race, in the process holding off club-mate Billy Doyle. There were two U10 sprint Golds for Bree by way of Leah Bolger and Jayden Kenny. Both also helped their relay teams to Gold. Meanwhile Kara Morrissey brought a rare sprint Gold to St Killian’s in U12 60m. The Girls U11 60m gave Bree AC a 1-2-3 with Ciara Laffan winning, Keira Wilson 2nd and Maura Doyle 3rd. For Ciara herself it was a case of 1-2-3 as this gave her a third Gold medal of the Championships as she won 100m and Long Jump the previous day. It was a day with many tight finishes across all events. One of these was the Gold medal winning jump by Lucy McCormack of Menapians which, at 3.03m, was just 2cms clear of Nessa Long’s best effort. Taghmon’s Dearbhla O’Hanlon won Gold in U16 High Jump and took Silver in 80m Hurdles. Club-mate Hannah Roche Kelly picked up a Bronze in U17 200m to go with her Gold in Long Jump and, from the previous day, 1500m Silver. Earlier in the day the club’s Ben O’Toole was a comfortable winner of the U13 80m while his sister Chloe won U15 200m. Ben also picked up a Silver in 600m. Add to that tally his Golds in 100m and Shot Putt and it was a good campaign overall for Ben. 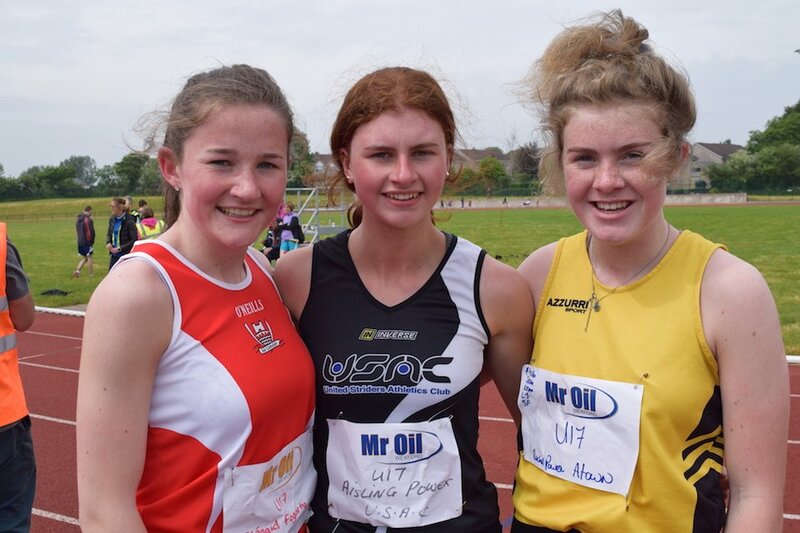 There were Race Walking Golds for Craanford’s Brídín Doyle (U14), Tríona Mooney (Adamstown / U19) and Striders’ athletes Aidan Kehoe (U14), Eve Byrne (U16) and Ryan Kielthy (U18). It was a great day for Bree in the Relays with Gold for U10 Girls, Gold and Silver for Boys U10, Gold for Girls U12 and Gold for Boys U14. The Striders U18 Boys team worked well together to take the Gold ahead of DMP. Space does not permit this report to cover all of the many heroic duels that took place on the day on both track and field. Hopefully, however, it serves to convey the strongly vibrant and competitive nature of the underage athletics scene in Co Wexford today. Tagged Wexford Athletics T&F Championships, Wexford Juvenile T&F Championships 2018. Bookmark the permalink.